First of all, thank you to all of you that gave me your suggestions on what to do in Smurfville, although I think some of you might have had some money slipped under the table by my husband to say such nice things about the color. 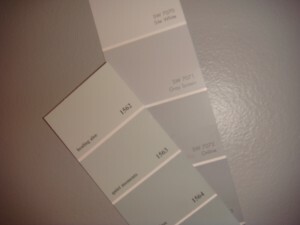 After the last couple days, I really should apply to work at a paint store. That is how good I have gotten at mixing colors. I have created my own little mixing area in the laundry room. I have gotten a little spoiled testing my color out until it is just perfect but I think I have an finally found an alternative to the Smurfville color. 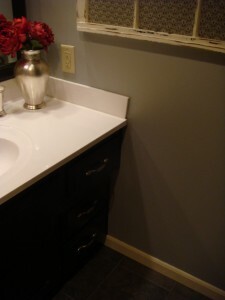 Thanks also to Amanda who gave me a tip about a Benjamin Moore color, “Quiet Moments.” My creation actually turned out very similar to the color but a little more blue and less sea green. And I also decided to paint the black trim, white to soften it up. With some wall accessories (50% off this week at Hobby Lobby) and some spa like rocks in to cover the drain, I think the room is finally complete and more importantly we are happy with the color. David even called it blue the other day!! So not only did the “Smurfville” paint go from trash to treasure but I also wanted to show off my (very little and quite boring) item that I had tried all week to find something big that was “Road Kill” ready for Beckie’s big Road Kill Rescue Party today but this is all I got! 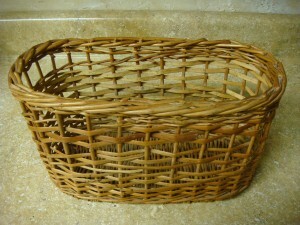 It was my sister in law’s little basket that was left over from our garage sale. It was going to the trash but I saved it thinking I was going to use it this summer to hold napkins and utencils for an evening dinner on the deck but that didn’t really happen, so with some spray paint and an old rose ball, it found a nice resting spot on top of the cabinet. 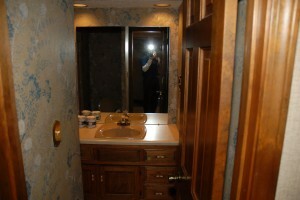 And now that I’ve done color - who knows how crazy I’ll get with new rooms…yeah right. Who am I kidding?! 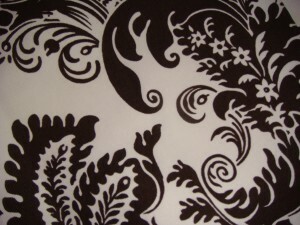 Oh remember this fabric from Ballard’s Backroom? …the reveal is coming soon!! Wow, the new color looks fabulous! I love your sweet little basket and I am so proud of you not to give up on color! I love it. It looks very clean and classic. Ok I am a nerd and realize that is the name of your blog but I seriously came up with that on my own. Thanks for linking up! shoot I mean BUY the spa rocks!!! Oh I love the new color! It’s very soothing and spa like! Blues are so hard to get right. I’ve been through that before too. It looks really pretty. Love the new color–You got it right! I am saving your blue suggestions! It looks so good. I love the color you chose. I hope you’ll come by for a visit. 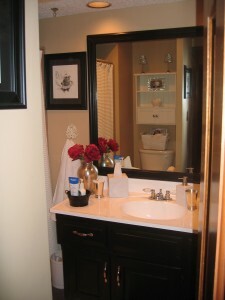 The new bathroom looks great! 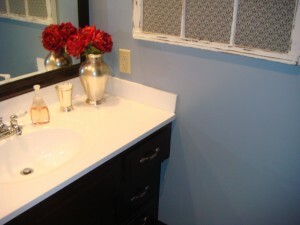 I did like the old blue, but this does look a little more polished for a guest bath. 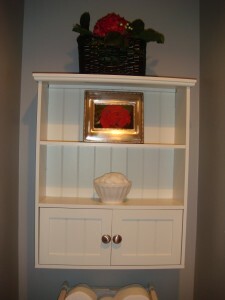 Great finishing touches too! The 4th is so pretty, I really like the roses. Hello Katie - I’m late making my rounds! 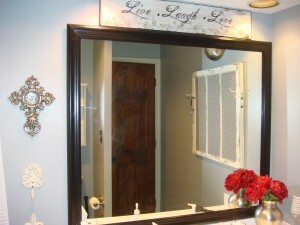 What a fabulous bathroom make-over. Love it. 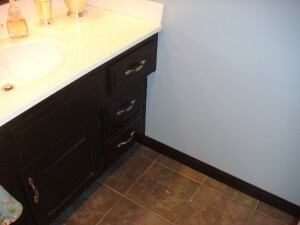 I painted my bathroom cabs black and I’m so happy with the look. 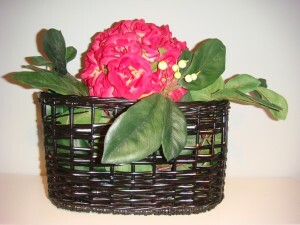 Your basket turned out so cool! Great job. Whoa cute idea on the rocks to cover the drain! I love it! 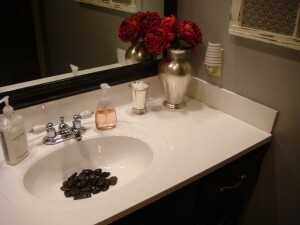 Why are the rocks in the sink? I love the way they look. Do you keep them there or was it just for photo effect? I love the re-do’s! I’m inspired!